Marcy is a mature dam but all the positive ways. 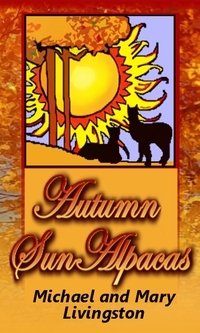 She is proven to produce improved crias following the colors of their sires. She has bred, birthed, nursed and nurtured with ease all females except for one male, and in fawn and brown colors from fawn sires and black color from brown, grey and black sires. Marcy has herself and has passed to her crias an uniformity of micron and style across her blanket, which leads to a lasting next-to-skin comfort-feel. Her fiber is still soft and bright now, with a smooth handle after several pregnancies. 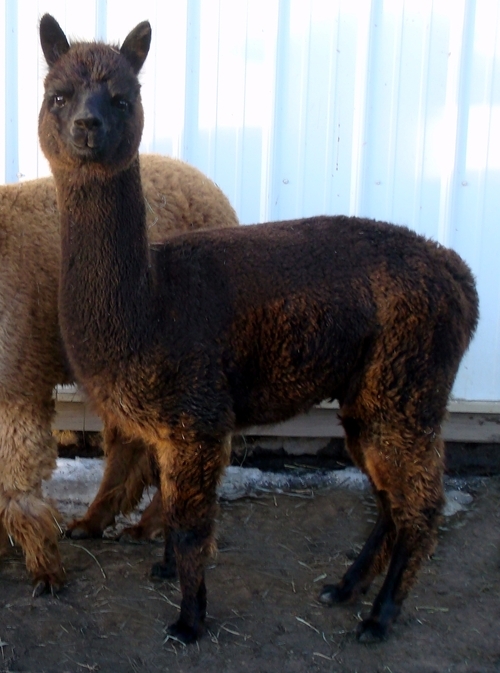 When bred to different males she has taken their attributes and added them to hers for an improved cria. 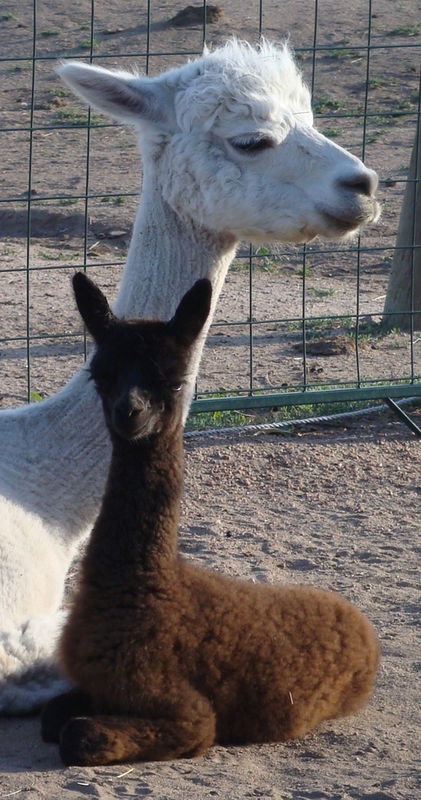 Marcy is a calm alpaca -- not a 'troublemaker' in the herd, easy to handle, and while being a good mom she isn't overly protective of her crias so as to make cria care a problem. She has no or care issues and is in good health. She is an attentive dam and productive nurser, with all of her crias having grown well. She is nicely conformed, still well balanced and relaxed in her easy, healthy movement. Our shearer had commented on how good her condition was, never guessing her to be a senior girl until told, and asked us how we kept our older alpacas looking good. His assessment reinforced our belief that good breeding and robust fiber come from healthy alpacas not 'dieting' to reduce their micron. These genetics are great for any developing breeding program, since she pushes the service sire's fiber qualities through to augment her own fineness, handle, staple -- producing crias with glowing brightness and a fine, even crimp. She is 17 and no longer breeding, but she makes a patient nanny and is an easy keeper. We are willing to let Marcy go as a free companion for any full priced dam, otherwise she is $100. We just want to make sure the farm she is going to will provide here with a good, forever home. Belle has bay black, crimpy, dense fiber with medium crimp and a nice handle with shine. And, not only is she black from a dark paternal lineage, she pushes color to her crias -- great for foundation girl in a colored breeding program! Belle has had two black crias, one sired by an appaloosa and one sired by a grey. She is one to add to a black program. One of two crias born on the Fourth... Of course, Belle had to have a patriotic name -- hence: Freedom Belle! Nice dark and crimpy fiber from a white dam and by a dark brown male. She has straight bones and well proportioned with a square frame. Belle broke her leg as a yearling and we had to recuperated her from the necessary surgery / cast. Whereas we make sure to check her periodically to make sure she is okay, she has never needed special treatment and has been one of the most healthy, robust alpacas on our farm. Belle has proven that she can carry and take care of her crias, with flying colors! 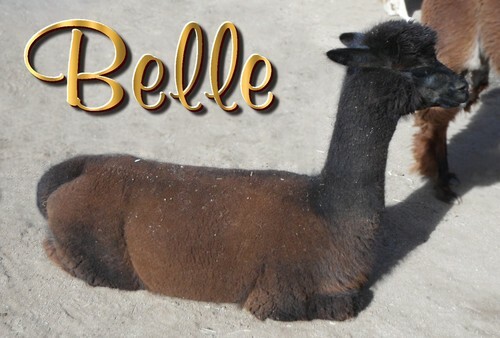 From her first pregnancy, Belle birthed a big, bay black boy that was up and running around the first day. She is a great mom and he grew to be a healthy, strong male! Good job, Belle! 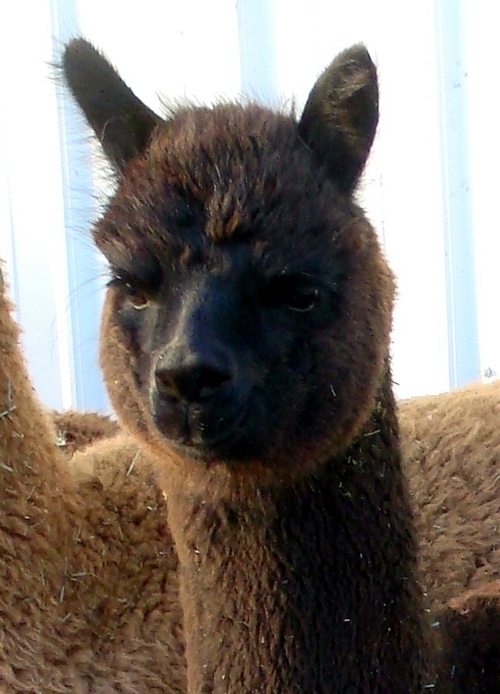 Her next cria was another beautiful black cria, sired by the medium silver grey herdsire, a true black girl that looks like she will pass grey as she has two matching grey spots on either side on her back legs!